The central part of the galaxy M77, also known as NGC1068, observed by ALMA and the NASA/ESA Hubble Space Telescope. Yellow: cyanoacetylene (HC3N), Red: carbon monosulfide (CS), Blue: carbon monoxide (CO), which are observed with ALMA. While HC3N is abundant in the central part of the galaxy (CND), CO is mainly distributed in the starburst ring. CS is distributed both in the CND and the starburst ring. A research team led by Shuro Takano at the National Astronomical Observatory of Japan (NAOJ) and Taku Nakajima at Nagoya University observed the spiral galaxy M77, also known as NGC1068, with the Atacama Large Millimeter/submillimeter Array (ALMA) and discovered that organic molecules are concentrated in a region surrounding a supermassive black hole at its center. Although these molecules around a black hole are throught to be dissociated by strong X-rays and UV photons, the research results indicate that some regions are shielded from X-rays and UV photons due to a large amount of dust and gas. These results, which were made possible by the high sensitivity and wideband observing capability of ALMA, will be a key to understanding the mysterious environment around supermassive black holes. Interstellar gas contains a wide variety of molecules and its chemical composition differs widely depending on the environment. For example, an active star forming region with a temperature higher than the surrounding environment stimulates the production of certain types of molecules by chemical reactions which are difficult to take place in a cold temperature region. This enables us to probe the environment (e.g. temperature and density) of a target region by studying the molecular chemical composition in the region. Since each molecule has its own frequency spectrum, we can identify the chemical composition and the environment of a remote target object through observations with a radio telescope. From this perspective, astronomers have been actively working on the starburst regions of galaxies and the active galactic nuclei (AGN) at the center of galaxies, which are called circumnuclear disks (CND). These regions are very important in understanding the evolution of galaxies, and radio observations of molecular emissions are essential to explore the mechanism and environment of these regions. However, the weak radio emission from molecules often made the observations difficult and took us many days for signal detection using conventional radio telescopes. 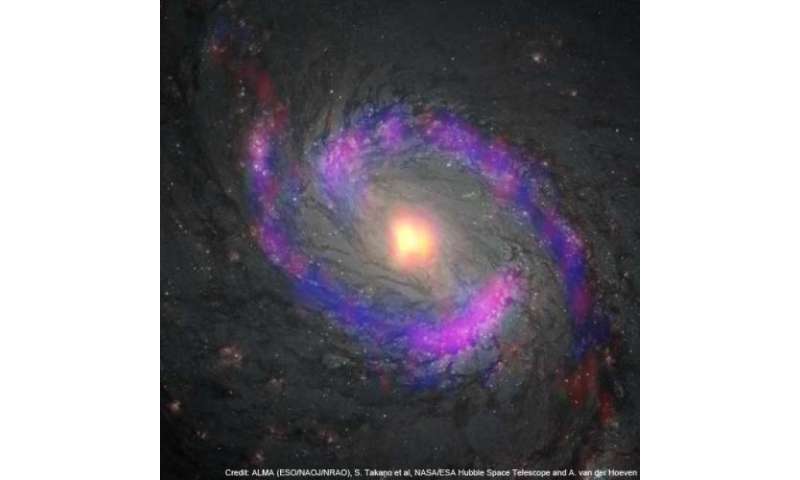 A research team led by Shuro Takano at the National Astronomical Observatory of Japan (NAOJ) and Taku Nakajima at Nagoya University observed the spiral galaxy M77 in the direction of the constellation Cetus (the Whale) about 47 million light years away with ALMA. M77 is known to have an active galactic nucleus (AGN) at its center which is surrounded by a starburst ring with a radius of 3500 light years. Since the research team had already conducted radio observations of various molecular emissions in this galaxy with the 45-m telescope at the Nobeyama Radio Observatory of NAOJ, they aimed to develop their research further with ALMA and identify the difference in chemical composition between AGNs and starburst regions. ALMA is a telescope suitable for analyzing molecules in galaxies because of 1) a high sensitivity to detect faint radio signals; 2) a high fidelity imaging capability to image actual gas distributions; 3) the ability to observe wideband multiple wavelengths simultaneously and high spatial resolution. ALMA observations revealed clearly the distributions of nine types of molecules in the CND and in the starburst ring. "In this observation, we used only 16 antennas, which are about one-fourth of the complete number of ALMA antennas, but it was really surprising that we could get so many molecular distribution maps in less than two hours. We have never obtained such q quantity of maps in one observation," says Takano, the leader of the research team. The observational results show that the molecular distribution varies according to the type of molecule. While carbon monoxide (CO) is distributed mainly in the starburst ring, five types of molecules, including complex organic molecules such as cyanoacetylene (HC3N) and acetonitrile (CH3CN), and concentrated in the CND. In addition, carbon monosulfide (CS) and methanol (CH3OH) are distributed both in the starburst ring and the CND. ALMA provided the first high resolution observation of the five types of melecules in M77, and revealed that they are concentrated in the CND. "It was quite unexpected that acetonitrile (CH3CN) and cyanoacetylene (HC3N), which have a large number of atoms, are concentrated in the CND," says Nakajima. The supermassive black hole in the AGN devours surrounding materials by its strong gravity and generates a disk around the black hole. The disk will be heated to a high temperature and emit intense X-rays or UV photons. When an organic molecule with multiple atomic linkages is exposed to strong X-rays or UV photons, the atomic bonding will be broken and the molecule will be destroyed. This is why the CND was thought to be a very difficult environment for organic molecules to survive. However, this ALMA observation proved the contrary; organic molecules are abundant in the CND. The research team assumes that organic molecules remain intact in the CND due to a large amount of gas which is shielded from X-rays and UV photons, while organic molecules cannot survive the exposure to the strong UV photons in the starburst region where the gas density is lower compared with the CND. Researchers have been actively engaged in observational research and the extablishment of theoretical models of AGNs, but it is just the beginning of the study on the shielding effect on molecules, which was discovered by these ALMA observations. These results were a significant first step in understanding the structure, temperature and density of gas surrounding the AGN. "We expect that future observations with wider bandwidth ad higher resolution will show us the whole picture of our target object in further detail and achieve even more remarkable results," says Takano. Could this massive black hole, some 13 billion light years away, be the remnant of the big bang? Yes, in the same way you are. Even lay observers can glimpse the implications of recent observations near the fabled beginning. How long will it take the pro's to acknowledge the obvious, and rescind their fanciful fairy tale?? ?